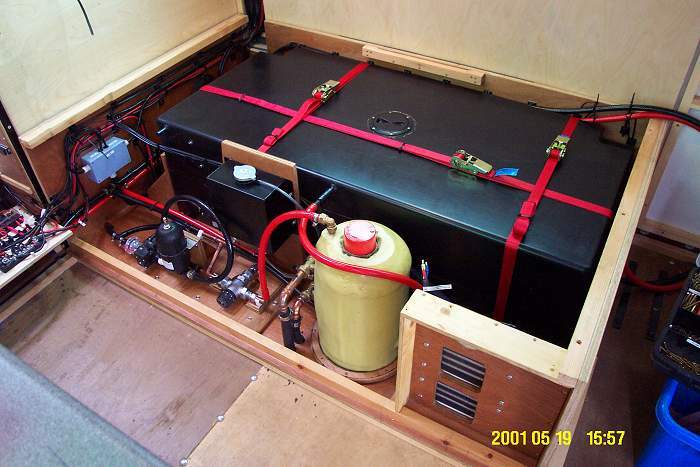 My Unimog campervan incorporates both a 340 litre fresh water tank and an Eberspächer "wet" central heating system within the body of the vehicle. 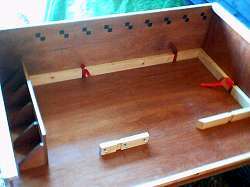 In order to limit the damage that might occur if either of these systems leaked they are contained within a "water box" that also forms the base of dinning area. The water box (1640mm long by 1050mm wide by 450mm deep) is constructed of 18mm marine ply and painted with three coats of yacht vanish. It will be fitted with a drain. The red "tags" (above) are where the three ratchet straps that hold down the water tank will be fitted. 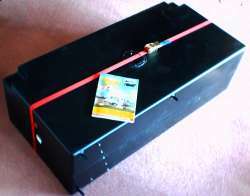 The fresh water tank (right) has a central inspection cover (under the strap) and three 15mm water connections (in, out and vent). 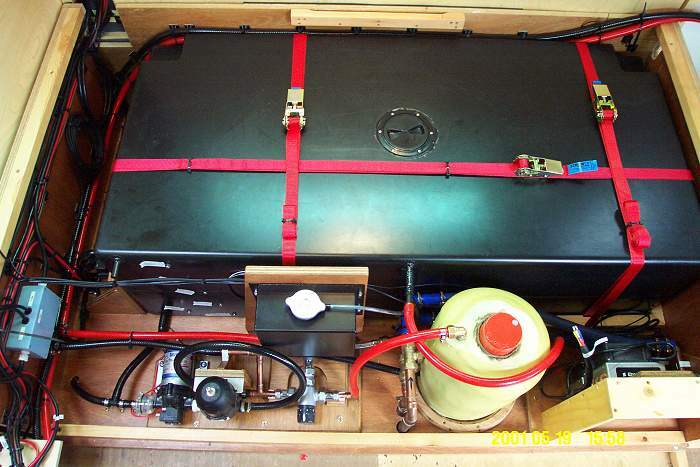 The six metal connections visible at the front left of the tank are for the water level gauge. Fresh water is supplied by a 24 volt Shurflow TK10 pump feeding a pressure accumulator to reduce pump cycling. 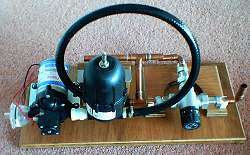 Hot water is supplied from a calorifier (an indirectly heated hot water tank, not shown) via a thermostatic mixer valve. Heating is provided by two 2.5kW fan matrix heaters supplied with pressurized hot water (>100°C) by an external Eberspächer diesel furnace. This also heats the hot water cylinder. 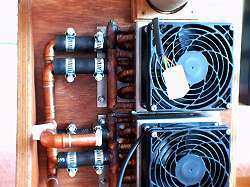 Both the pump assembly (above) and the heating assembly (right) will be mounted in the front of the water box. 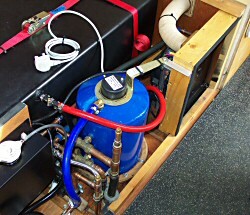 The red hose shown above connecting the top of the calorifier to the mixer valve caries very hot water and special (automotive) hose should be used. I know because the hose shown above failed. The calorifier (above) is mounted only by three small copper feet, held down by the wooden ring. After two years of use one of the feet broke and as a result of vibration the calorifier developed a leak. In 2004 it was replaced with a new calorifier and an additional mounting was added in the form of an immersion heater spanner glued to the top on the calorifier and bolted to a bracket on the side of the heater mounting. A 1kW immersion heater was fitted to the new calorifier that can, in emergency, be plugged into the 13 amp socket on the front of the kitchen units.